To foster an appreciation and raise awareness of our community’s historic architecture and history! The Haddam Historical Society is pleased to announce the Historic Building Plaque Program to identify historic structures and landmarks in Haddam, Higganum and Haddam Neck. The program will pay tribute to the historic character of the community and give recognition both to its historic structures and early residents. The program will also enrich our understanding of Haddam’s past and its architectural heritage. Haddam has a long and distinguished history, from Native American possession to a 21 st century bedroom community. Our buildings and architecture represent many different chapters in our town’s heritage, including the early colonial period, its heyday as a 19 th century county seat, and the industrial revolution in the late 1800s. Haddam also features 20 th century suburban architecture as well as agricultural, industrial and institutional buildings, all of which contribute to our sense of place and the character of our community. 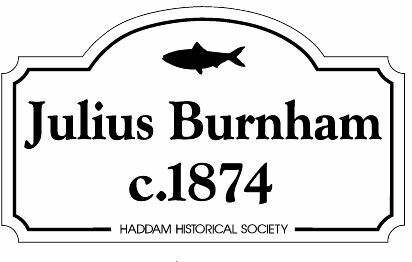 Historic plaques are available through the Haddam Historical Society for buildings 50 years or older. Each plaque will list the date of the building’s construction and the original owner or occupant. The plaques are 23.5 x 13.75 inches and are fabricated of Excel® board painted off-white with painted black lettering. The cost of each plaque will be $200. To qualify for a plaque the building must be at least 50 years old, visually recognized as a historic building, and its history must be documented in keeping with the Connecticut State Historic Preservation Office. The Connecticut Historic Resource Inventory Survey (completed in 1986) will serve as the basis for dating and naming a building for those buildings surveyed. However, additional research by a professional historian will be considered if the date is disputed or if primary documentation is submitted establishing an authentic date. The Society can also provide research for undocumented buildings for an additional charge of $50. Included with the plaque will be a copy of the Historic Resource Inventory Survey (if surveyed) or a report with house description, research and other relevant historic documentation if surveyed by HHS. All plaque participants will receive a complimentary copy of the 1874 Beers Map of Haddam.